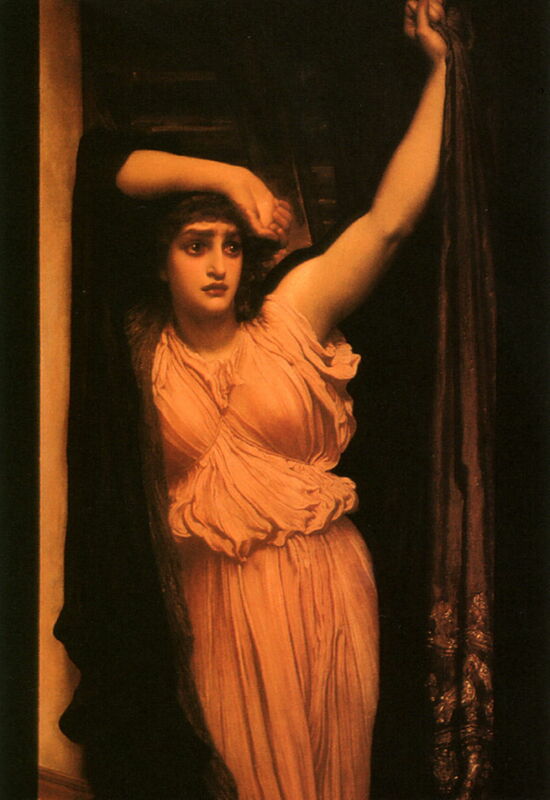 Frederic Leighton, 1st Baron Leighton (1830–1896), Last Watch of Hero (1880), further details not known. Wikimedia Commons. There can be no more hapless lovers than Hero and Leander. It’s bad enough that his parents would have disapproved, so the relationship has to be kept secret. But when the couple are separated by one of the world’s treacherous stretches of water, the Hellespont (now the Dardanelles), that left Leander only one option: to swim. The legendary crossings which Leander made of the Hellespont were about a mile as the crow flies. Given the strong and often conflicting currents which rip through the strait, and its surprisingly cold water, they might seem almost suicidal. So on 3 May 1810, the twenty-two year-old British poet and writer Lord Byron tried it for himself: it took him seventy minutes, during which he reckoned that he swam further than the direct mile, as he was drawn to zig-zag by the currents. Now swimming the strait has become an annual event, entered by those who have swum the Channel or accomplished similar demanding feats, and is held on 30 August each year. Legend tells us that Leander, a young man living in Abydos on the south-eastern (Asia Minor) bank of the Hellespont, and Hero, a beautiful young woman living in Sestos on the north-western (European, Thracian Chersonese) bank of the Hellespont, fell deeply in love. But in fear of Leander’s parental disapproval, they had to meet in secret, so he took to swimming that hazardous mile each evening that he visited Hero, and later its return. Their relationship developed, and was consummated, and they appear to have established a reliable routine. Leander navigated his way across not using the stars, but by the light which Hero provided on top of the tower in which she lived – an ancient lighthouse. Edward Burne-Jones (1833–1898), Hero Lighting the Beacon for Leander (1875-77), oil on canvas, 73.7 × 79.1 cm, location not known. Wikimedia Commons. 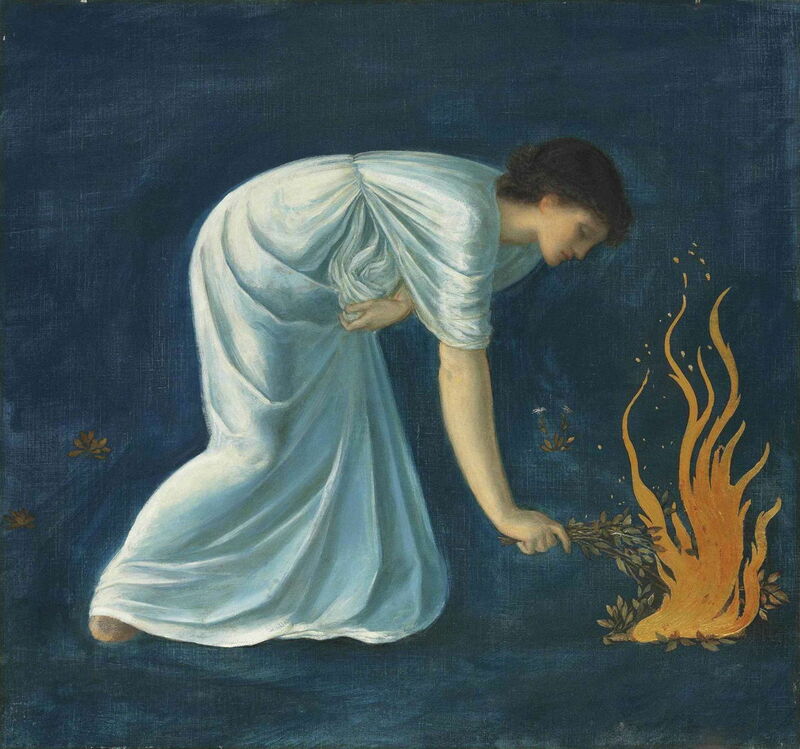 Edward Burne-Jones shows her bent over, placing small kindling on a fire, in his Hero Lighting the Beacon for Leander (1875-77). Three little flowers suggest that this is at ground level rather than on top of a tower, though. Evelyn De Morgan (1855–1919), Hero Holding the Beacon for Leander (c 1885), gouache on paper mounted on panel, 57.8 x 29.2 cm, Private collection. Wikimedia Commons. A decade later, Evelyn De Morgan’s Hero Holding the Beacon for Leander (c 1885) places Hero down on the shore, holding a small torch aloft, looking out for her lover as he makes his way through the choppy water. Interestingly, there is a red thread, wool perhaps, which runs from her clothing, under her left hand, which may be a reference to the thread of life, or that of time. William Etty painted two works based on this legend. 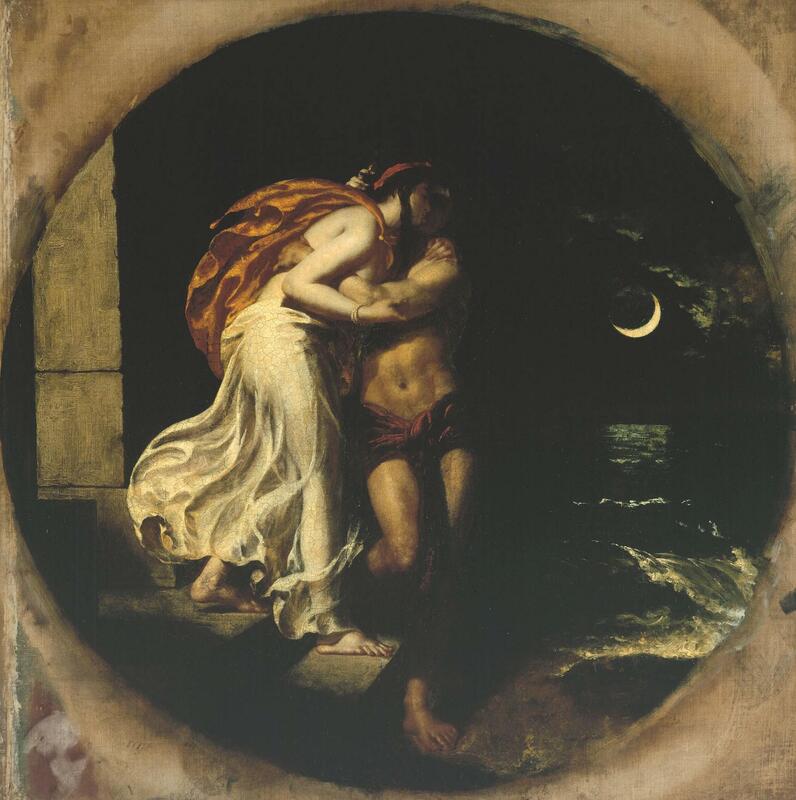 The first, The Parting of Hero and Leander (1827), shows the two lovers embraced, at the moment that Leander is about to start his swim back over the Hellespont to Abydos, one night. Ovid devotes a pair of letters in his Heroides (Heroines) to this tragedy. The first is written by Leander to Hero, after a week of stormy weather had prevented him from swimming over to her. He explains the situation, tells her that he set off three times, only to be beaten back by the waves, and how he yearns for calm weather so that they can be together again. In its last lines he asks that Hero keeps her light constant, where he can see it – ominous words. Hero’s reply is hardly reassuring: she can’t bear their being apart, her passion burns, and if he doesn’t get there soon, she writes that she will surely die. In its later lines she urges him to be cautious, and to wait for better conditions, but the damage has already been done. Soon after receiving her letter, Leander gives it another go, although the storm has hardly abated. As he is in the middle of the Hellespont, the wind and rain extinguish Hero’s beacon. Frederic, Lord Leighton’s Last Watch of Hero (1880) shows Hero watching anxiously for Leander to complete the crossing. 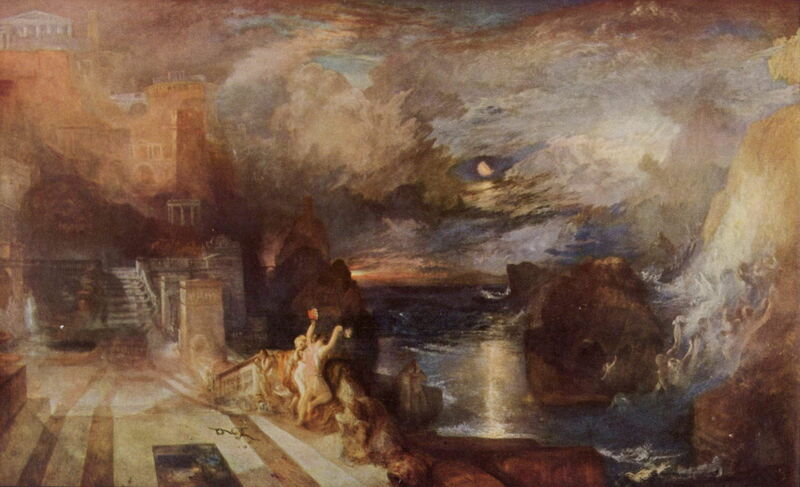 JMW Turner’s The Parting of Hero and Leander (1837) is a dramatic and complex work with elements of both the precursor to the climax, and the climax itself. Sestos is on the left, with a couple of towers visible on the coast, neither of which contains Hero’s light. Leander is seen swimming across the narrow straight (its width shown far smaller than in reality), from right to left, to join Hero. Behind him on the bank at Abydos are spirits emerging, indicating his imminent death. Turner shows Hero holding up a lantern, conflicting with accounts of the legend which place the beacon at the top of Hero’s tower, and ignoring the important detail of the beacon being extinguished by the storm, so leading to Leander’s death. 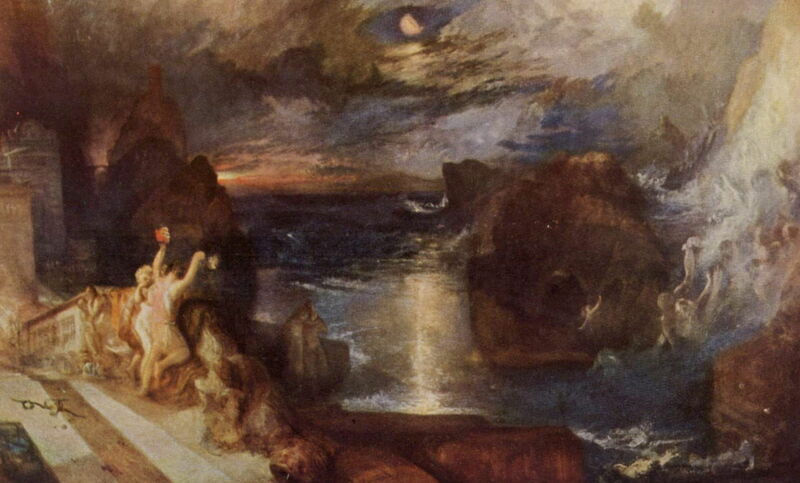 Turner exhibited this painting in 1837, providing his own verse to tell the story, which was most probably based on Lord Byron’s account in his Written After Swimming From Sestos To Abydos. The legend continues that, deprived of the guidance of Hero’s beacon, Leander couldn’t reach Sestos, and drowned. Hero saw her lover’s lifeless body, so threw herself from the top of her tower to join her lover in death. This is the climactic scene which has been most favoured in art. Peter Paul Rubens (1577–1640), Hero and Leander (c 1604), oil on canvas, 95.9 × 128 cm, Yale University Art Gallery, New Haven, CT. Wikimedia Commons. Peter Paul Rubens quite youthful account in his Hero and Leander of about 1604 is big on storm and drama, but difficult to read clearly. 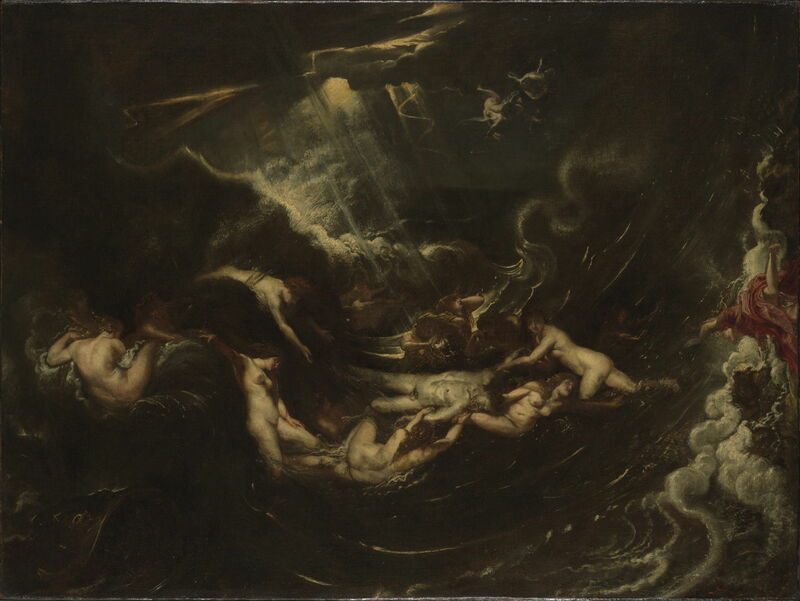 Leander’s body is being brought through the huge waves by a team of Naiads, as Hero, wearing a brilliant red gown, plunges to her death at the right. Domenico Fetti (1589–1623), Hero Mourning the Dead Leander (1621-22), oil, 41 x 97 cm, Kunsthistorisches Museum, Vienna, Austria. Wikimedia Commons. My favourite painting of the climax is Domenico Fetti’s slightly later Hero Mourning the Dead Leander (1621-22), despite its curiously calm waters. A more modest group of Naiads in the centre are tending to Leander’s corpse, as a winged Cupid cries over them. At the right, Hero falls head-first from her tower to inevitable death. On the left, Fetti provides a couple of evil-looking sea monsters, and Venus making her way onto her large clam shell. 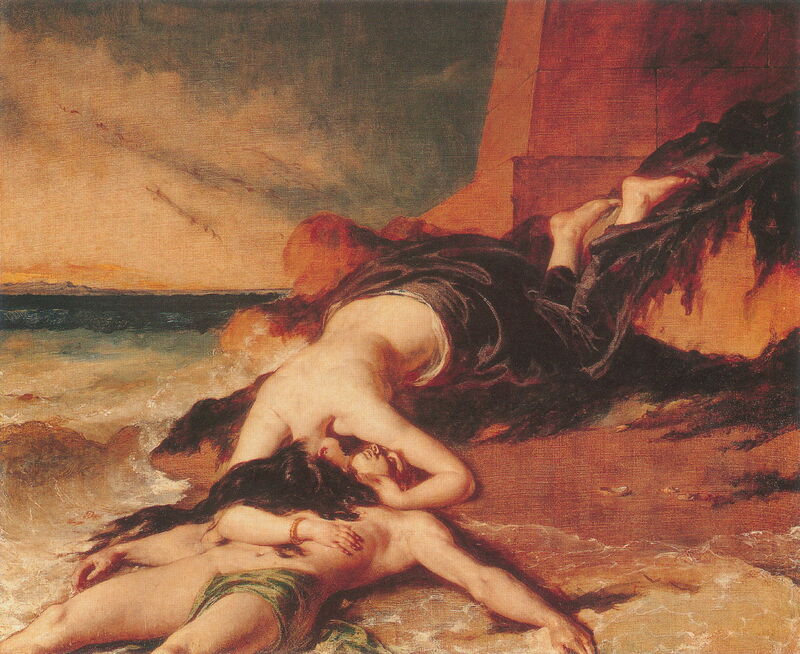 William Etty’s second painting of the story, Hero, Having Thrown herself from the Tower at the Sight of Leander Drowned, Dies on his Body (1829), also shows the ending: Leander has already drowned, Hero already thrown herself from the tower, and is now in the (rather unconvincing) throes of death, just about to join her lover in the afterlife. When passions burn fiercely, we all too often follow the impetuousness of the heart. Posted in General, Life, Painting and tagged Burne-Jones, Byron, De Morgan, Donne, Etty, Fetti, Heroides, heroines, myth, narrative, Ovid, painting, Rubens, Shakespeare, Turner. Bookmark the permalink.